This book-collection file includes: Alcatraz, Black Jack, Bull Hunter, Gunman's Reckoning, Harrigan, The Night Horseman, The Rangeland Avenger, Riders of the Silences, Ronicky Doone, The Seventh Man, Trailin', The Untamed, and Way of the Lawless. According to Wikipedia: "Frederick Schiller Faust (May 29, 1892 - May 12, 1944) was an American fiction author known primarily for his thoughtful and literary Westerns. 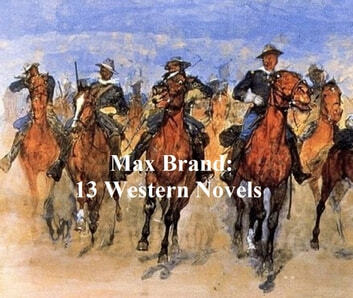 Faust wrote mostly under pen names, and today is primarily known by one, Max Brand. Others include George Owen Baxter, Evan Evans, David Manning, John Frederick, Peter Morland, George Challis, and Frederick Frost. ... Faust managed a massive outpouring of fiction, rivaling Edgar Wallace and especially Isaac Asimov as one of the most prolific authors of all time. He wrote more than 500 novels for magazines and almost as many stories of shorter length. His total literary output is estimated to have been between 25,000,000 and 30,000,000 words. Most of his books and stories were turned out at breakneck rate, sometimes as quickly as 12,000 words in the course of a weekend. New books based on magazine serials or unpublished manuscripts or restored versions continue to appear so that he has averaged a new book every four months for seventy-five years. Beyond this, some work by him is newly reprinted every week of every year in one or another format somewhere in the world."